RIPPED BY AN ART THIEF, THUS THE TEMPORARY WATERMARKING ! made it from d.gray-man since i like it very much and especially i love allen, because of his cool eye and anti-akuma weapon. next day i made the lineart so that i could start inking the drawing on the day after that day. drawing is wholy made by hands with bottled ink and pencil made for drawing with ink. inking too about two weeks but wanted to it with ink since i have don't anything with it for a while. inking took me about two weeks, couldn't do it as fast as i would have wanted because i have so long school days and much homeworks. but then again i'm happy that i had to make it with slower pace so i got more time to think properly how i would do the effects and so on. and i think this is the best drawing i have made with ink ^_^ please tell me your opinions of it ! i think the hardest thing was to think how i would make the toning for the akumas on the background since i can't use any drawing programs on pc to get gray tones. but i think the way i did them is quite good, at least my dad said so ^^' i was also worried if the background is too white since all the characters are so dark but now i think it's good so you can figure out different details better from it. also wanted to draw allen's eye look bit scary but not to look too crazy XD i think it turned out pretty good, but i'm not sure how you see it so please tell me. ps: it looks better if your screen adjustment isn't very bright ~ the smoothness of the black comes better shown when the brightness adjustment is bit darker than really bright. Proposed by LordWe and highlighted by euna. The drawing is very detailed and the Shadow and light contrast creates a perfect ambient for the proposition. Whoa, just whoa. You just managed to make me rethink my attitude towards fanart. XD This piece rocks! I especially love how you gave it that jagged black boarder around. 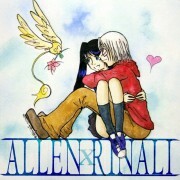 It adds so much emotion and feeling to the wall, and all that black is kind of fun cause it makes Allen stick out more. Great job (you deserve the Elite)! I just recently started watching this anime and you've done a great job capturing the dark side of the story! Lovely job on the inking... you can really tell that you put a lot of effort into this one! I especially like how you shaded the akuma in the background... Cheers and congrats on the highlight! Excellent job, it totally deserves the highlight! u must have paid lots of efforts on this. congrates for the highlight. u deserve that. keep it up. Omg! I'm loving this! 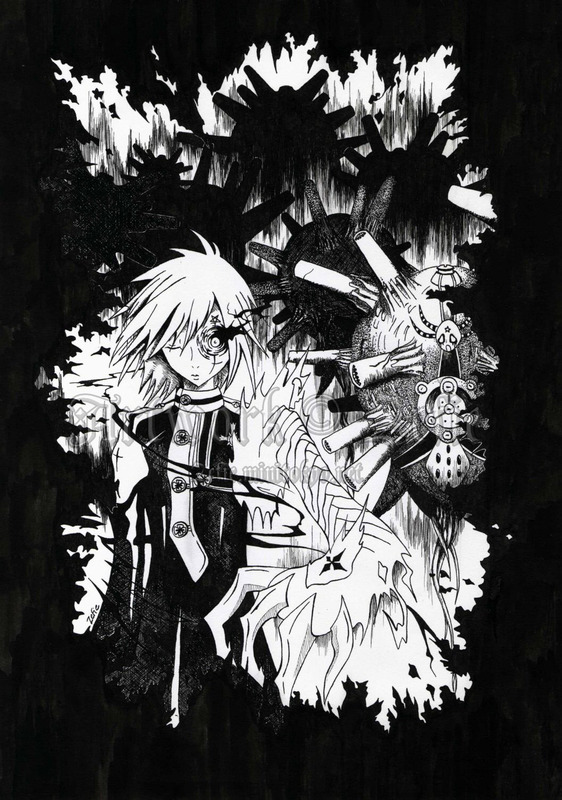 Allen Walker looks really awesome here! Your fine detailing always impress me! I can't describe how awesome your inking is. The shading and toning looks really superb! Awesome work as always! It amazes me how that ever since I picked up that manga last week I keep seeing stuff about it.Mayb e I'm destined to read it or something ^_^'. Anyway,this is a wonderful piece of doujinshi,shading and linework is nicely done right done to the T.If I'm not mistaken that's one of the Akuma from the first manga :3.Anyway,excellent work. Yes, its realli beautiful! If onli i could do stuff like this! =) Anyway, very nice! Appreciate for uploading it! i like this stye~=) the color is simpe,only black and white,but is particularly~. Really nice and incredible detail, I certainly wouldn't be able to do that. Really nice use of the ink and black space, and the lines itself are very clean and beautiful. Really love your inking Zefie, your work is certainly amazing and beautifully drawn! oOOHhhh... a piece of a "WHOAAA" expression art! Nice I love it!